Tis the season for holiday parties! The Christmas trees are up, the Menorah candles are out and of course, Santa is checking his list to see who was NAUGHTY or NICE. 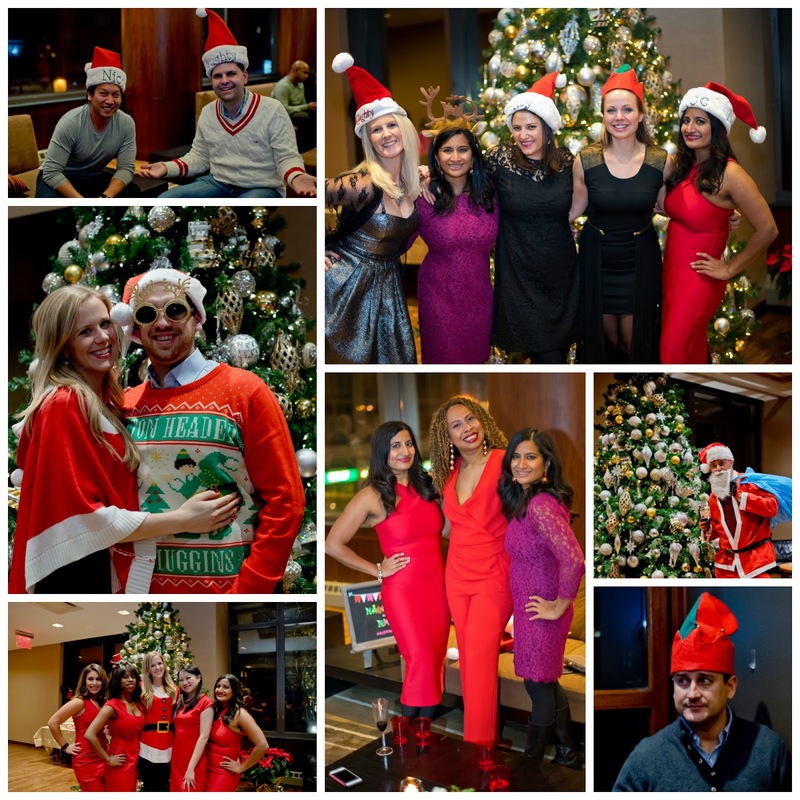 Last weekend, we cohosted a glamorous Naughty or Nice soirée with our friend, Stephanie. We are excited to share the details with you. We rented a beautiful space to host our Naughty or Nice holiday party. We put a chic twist on the traditional Christmas colors by combining vibrant reds and fresh whites with gorgeous pinks and dramatic blacks. Inga from International Garden created our stunning floral arrangements. We placed a beautiful bouquet of pearl tulips, crimson carnations, white roses, fuchsia roses and red berries on the coffee tables. We scattered hurricanes with cherry gems and crisp white votive candles around the arrangements. We placed scarlet roses, white roses and blush snap dragons on the buffet table. We mixed up the flowers on the bar with scarlet roses, fuchsia roses and white snap dragons. Kanchana created our whimsical “Naughty or Nice” chalkboard sign with adorable Christmas themed letters. Guests were asked to dress in holiday attire, which ranged from red cocktail dresses, Santa hats and ugly Christmas sweaters. Our friend, Eric, arrived in full Santa costume. We placed Naughty or Nice hats, elf hats, reindeer ears and reindeer glasses around the room and guests used them as props throughout the evening. We created a beautiful bar with a few decorative pieces. We framed the bar table with a black, red, white, bubblegum and blush paper tassel garland. Kim Stoegbauer of HGTV has an easy to follow DIY tutorial. The tassels are time consuming, so if you are running short on time, you can purchase the garlands from the Paper Lantern Store or Etsy. We also decorated the bar with two bud vases filled with scarlet roses, fuchsia roses and white snap dragons and pink, red and black chevron napkins. We stacked wine glasses and champagne flutes on each side of bar. We even dressed the wine in Santa and reindeer wine toppers from Pottery Barn. We showcased an adorable Santa pants wine bag from Pottery Barn. We believe every party should have at least one signature cocktail. Guests had their choice of “The Naughty-tini,” a cranberry gin martini, and “The Nice-mopolitan,” a white cosmopolitan. We also served the holiday classic, Eggnog, and an assortment of red and white wine. We started the festivities with a toast of champagne. Cooking for 60 guests can be daunting, so we asked our guests to bring a Christmas themed dish. The crowd favorite was the Twelve Drumsticks Drumming, which we ordered from BonChon Chicken. They were deliciously spicy and naughty! Our holiday dessert table was stunning. We framed the table with another paper tassel banner in our color palette. The key to create a beautiful dessert display is utilizing platters and cake stands in a variety of sizes, heights, shapes and widths. We incorporated a beige tablecloth, silver cake plate and white platters. We recommend sticking largely to white serving dishes as colorful desserts photograph beautifully against them. The highlight of the dessert table was the GORGEOUS Christmas present shaped cake, which was designed by our favorite bakery, Mother Mousse. We surprised our cohost, Stephanie, with the cake in honor of her upcoming 35th birthday. We also surprised our friends, Jason and Vadim, with some cupcakes to celebrate their recent birthdays. 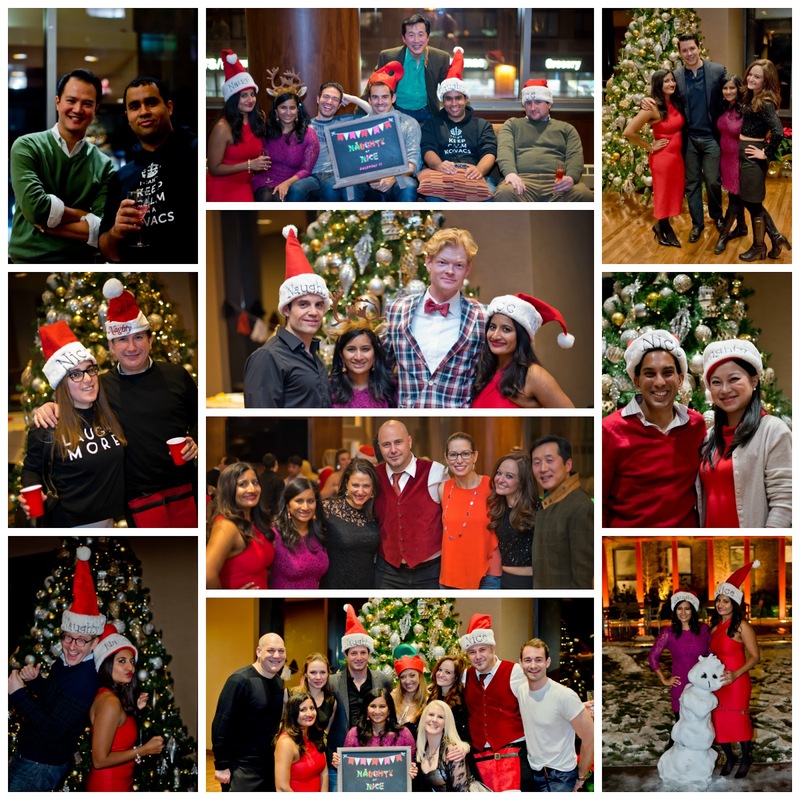 Thanks everyone for joining our first holiday party. We can’t wait to do it again next year!